Gracie is an extremely high-energy, anxious and challenging pup. The ideal home for Gracie will have someone home full time. She will need a home that can provide structure and lots of mental and physical stimulation. A fenced yard is required. We need someone who is committed and has the time needed to work with her to build her confidence, provide positive reinforcement and socialize her (people, other dogs, cars, just about everything). She would be ok with another dog, as long as he/she was very mellow. She is good with cats. A home with kids would not be a suitable placement for her due to the amount of time that she will require. Because she is a puppy, she still gets into things, chews things up, digs, etc. — so she must be watched closely. 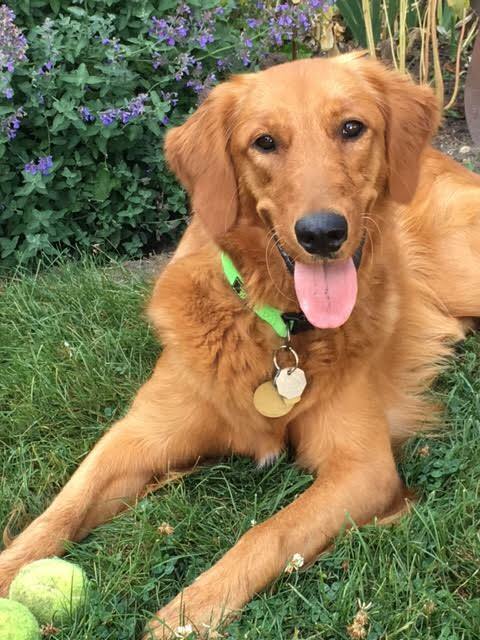 We know Gracie will be a wonderful companion for someone who can be dedicated to her continued growth and training, and will help her become a confident, happy golden.